With eight hens in our backyard, it's a rare day when my boys don't gather at least six eggs. They have a few regular customers who buy a dozen every couple of weeks, but more often than not we have a couple of full egg cartons sitting on the shelf in our frig. When I heard an NPR brief about a new cookbook all about eggs, I knew I had to take a look. Put cold eggs in a pan in one layer, cover them with water by about 1 inch, and put the pan over high heat. When the water comes to a full boil (at least 209F), cover the pan, remove it from the heat, and let it sit for 15 minutes. Remove the eggs to an ice bath (half ice, half water) until they're completely chilled, at least 10 minutes but preferably longer, giving the water a gentle stir every now and then to keep the cold circulating. Simple, right? And I've had perfect results every time. Then there's soft-cooked eggs and - I learned a new vocabulary word - mollet eggs (in which the white and part of the yolk are solid but the yolk's center is still fluid), deep-fried eggs cooked by cracking an egg into boiling oil and shirred eggs baked in direct heat instead of a boiling liquid. And that's just the beginning. I've been cooking scrambled eggs all wrong, apparently - they should be prepared in a double-boiler or saucier for best results - and when I master that basic dish Ruhlman promises me that "your life will be immeasurably better." This book contains recipes for everything from pancakes to popovers, strata to quiche, and challah bread to sponge cake. I learned why the last time I tried to make lemon curd I ended up with tiny particles of cooked egg white in it and how to prevent that from happening again. And I cannot wait to try out the Make-Ahead Brownies, homemade Mayonnaise and chocolate mousse. The yolk is a kind of diva in the kitchen. The white is more akin to an Olympic gymnast--its range and power are nothing short of astonishing. I thought I knew how to cook eggs pretty well, but I have much to learn. 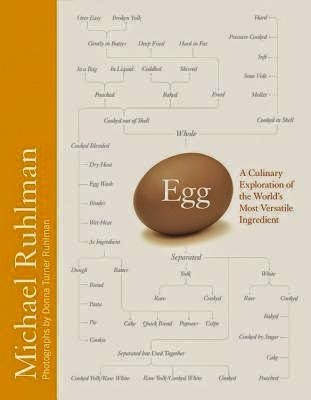 I'm excited to try out many of these techniques that are new to me, though I'm not convinced of the necessity of separating the yolks by hand - literally, with bare hands - which Ruhlman recommends as the "easiest and fastest" way. Now, if you'll excuse me, I need to go buy some ramekins.